» Get faster in final cut pro -9- move keyframes you down with FCP? Final cut doesn’t make it easy to move multiple keyframes – but it is possible! You can move both audio and video keyframes, but they each require a different approach. hit option t with the timeline window active. look for the blue bars under your video clip. hit ‘ a’ and position your cursor over the blue bar. click and drag the blue bar to reposition the keyframes. 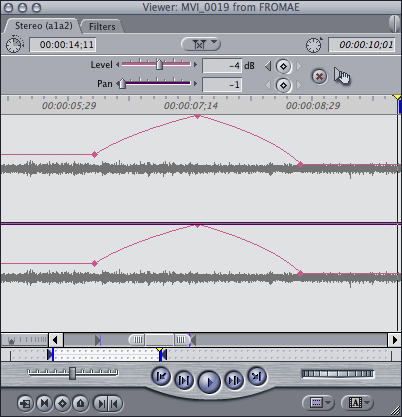 double click on the audio file. hit ‘s’ for the slip tool. click and drag the red levels graph to reposition the keyframes. Sometimes it’s easier to watch it done, so more info (and a video) here at aled4d’s blog. ~ by ross on March 11, 2010. Thanks man! i had to use this today.